What inspires you? What gets your blood pumping? Is it great food, good company or a task well-done? If you are a photographer or writer, amateur or pro, what is your muse for a beautiful photo or an insightful blog post or story? The Weekly Photo Challenge asks us this question. If you follow my blog, you know that wind and water are my twin muses. As an avid board sport enthusiast, wind and water attract me like a moth to flame, or a duck to water (wink). I also can’t get enough of pine covered mountains. There is nothing like the inspiration of leisure to be the muse for many people. I hope you enjoy this collection of some of my favorite leisure spaces. Beautiful pictures! Makes me miss the ocean. I lived in the desert for a few years, and I’ve moved to a mountainous area now. I long for the day I can visit the coast again. Thank you, I’m happy you liked them. My smart phone is getting stupider. It is 3 years old and WordPress no longer even comes up. I hate typing on them too. Oh did I mention I am stupider than the stupid iPhone 4 I have. Thank you for those kind words, Britta! That first shot is glorious! Lovely post Terri – there is just something about water, isn’t there? Water always inspires me. 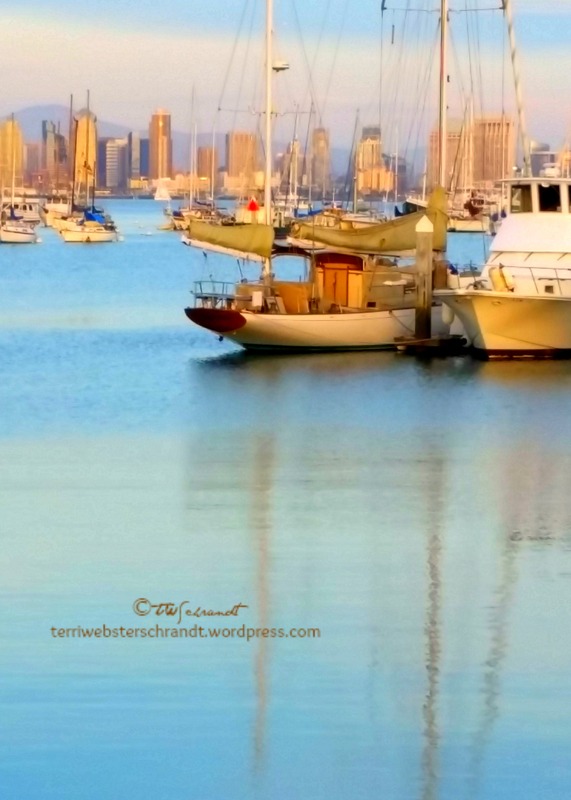 I love that photo of the boats near San Diego, gorgeous! It looks like a watercolor painting. All your pix are very calming. I don’t like to be in nature actually, but I enjoy looking at it in pix! Terri, thanks for being so faithful to like my blog. I appreciate it. Terri, how special and fitting to write that water and wind are your muses….Indeed, these parts of nature are your lifeblood and it shows in your writing and in your inspiration for it! Hmm, my muse? I think kindness…whenever I see an act of kindness around me, it makes me want to write about it…Oh, and also good food! Have a lovely rest of your Friday — it’s sunny and gorgeous here in NYC…Finally!! Lia, that would be lovely to read your view on acts of kindness! Or food 🙂 Glad you have sunshine, We have waaayyy too much today. Enjoy your day!! Today we have rain and only 70 degrees here…Please send some of that sunshine here and I’ll send the rain out there! Have a super weekend and I’ll write something soon…It’s churning in my brain! Love the shot of “Windsurfers at Sherman Island” looks a lot of fun. Thank you! It is fun…it was VERY windy, so too rich for my blood, LOL! It’s really close to the Point Loma Seafood shop.